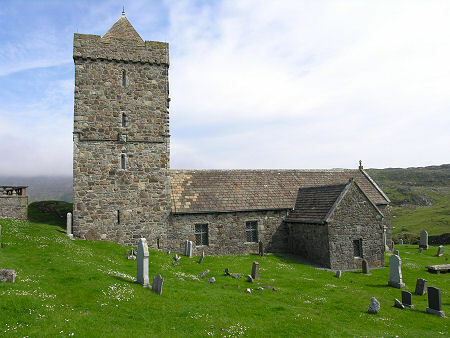 St Clement's Church (Tur Chliamainn), or the Church of Rodel as it is also known, was built from about 1520 by Alexander MacLeod of Dunvegan and Harris. 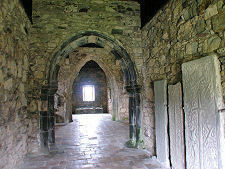 It is generally thought to be the grandest medieval building anywhere in the Western Isles. 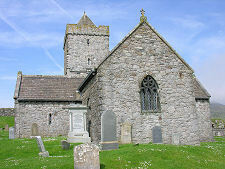 St Clement's Church is believed to have been built on the site of an older church of unknown origin and date. 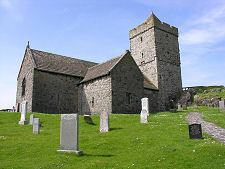 It fell into disuse after the Reformation in 1560, though the churchyard remained the preferred site for MacLeod burials. 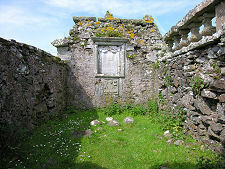 The church was extensively repaired and given a new roof by Captain Alexander MacLeod of Berneray in 1784, but it burned down almost immediately, leading to further rebuilding and restoration in 1787. By 1840 St Clement's had again fallen into disrepair, and the Countess of Dunmore arranged for it to be repaired in 1873: this is commemorated in a stone plaque over the door in the nave. In 1913 the harling was removed from the outside of the walls, and the tower, which had been struck by lightning in 1907, was partly rebuilt. 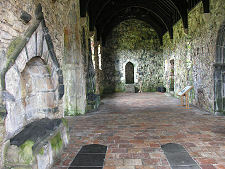 Today the church is in the care of Historic Environment Scotland. Entry is via a door in the north side of the nave. 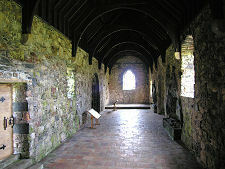 The interior of the church is a plain cruciform in shape, with north and south transepts not quite mirroring one another on either side of the nave. The nave and the choir would originally have been separated by a wooden screen. 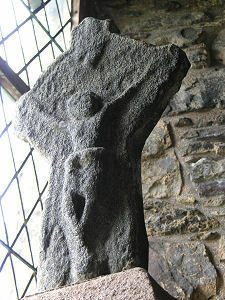 Almost opposite the door, in a window opening on the south side of the nave, is the head of a late medieval disc-headed cross, showing the crucifixion on the front. Leaning against the wall of the north transept are five grave slabs. Four are medieval in origin, while the fifth is dated 1725. 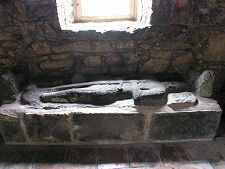 The south transept is home to a tomb of a knight in armour, believed to be John MacLeod of Minigish, clan leader of the MacLeods until his death in 1557. Much better know is the tomb of the church's founder, Alexander MacLeod, also known as Alexander Crotach, or humpback as a result of a sword wound he had received while fighting the MacDonalds on Skye. Alexander's tomb is built into the south wall of the nave. 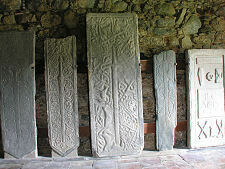 It carries the best collection of medieval sculpture in the Western Isles. The arch surmounting the tomb is surrounded by biblical designs while within it are some truly spectacular carvings. 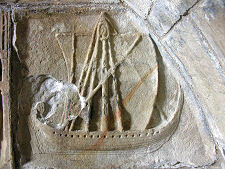 These include a hunting scene in which a knight pursues two stags, and a rare depiction of sailing galley of the 1500s. Also shown is a castle, presumed to be Dunvegan. At the bottom is the stone figure of a reclining knight in armour, on top of the chest in which Alexander was laid to rest. 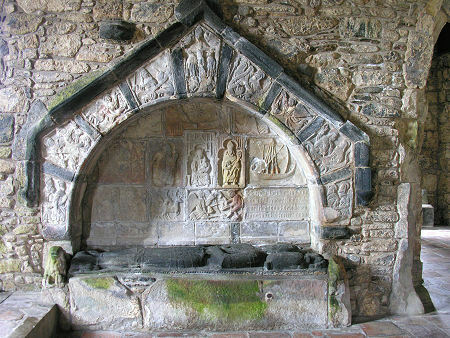 The work is signed off with this inscription in Latin: "This tomb was prepared by Lord Alexander, son of William MacLeod, Lord of Dunvegan, in the year of our lord 1528". The tomb was probably designed to be painted in bright colours. In some ways the most striking aspect of St Clement's Church is the tower. This is built on a rocky outcrop at the west end of the church to emphasise its height. 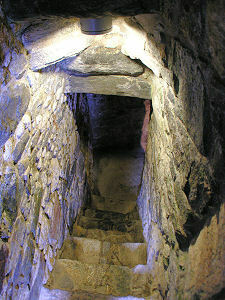 It is accessed via a door at the west end of the nave which leads via a dark stone staircase built into the thick walls of the tower to the lowest of the tower's floors. This is built on top of the rocky outcrop and at a much higher level than the ground floor of the nave itself. Access to the upper floors in the tower is via a series of wooden ladders, as it would have been when the church was built. The exterior of the tower carries an interesting collection of motifs. These include bulls' heads on two corners at three-quarters height, and carved panels on each face set into the string course. Aspects of the carving above the door on its west side look more pagan than religious in origin, while the panel on the south side of the tower carries a "sheela na gig" and should probably not be viewed too closely by anyone of a sensitive disposition (and is not shown on this page for the same reason). The graveyard surrounding the church on its steeply sloping site contains a number of burial enclosures commemorating MacLeods buried here. For a coastal site it is a surprise to find that the graveyard offers no sea view. Instead the slope ensures it looks north towards the mountains of South Harris.